Disney classic minifigures are coming soon! Beginning May 1st, Disney LEGO minifigures will be available through ShopLEGO.com, LEGO stores nationwide, and stores where you normally buy LEGOs. Soon to be added to your collection will be 18 classic and newer characters including Mickey, Minnie, Donald, and Daisy. Priced at $3.99 my guess is these will be individually packaged in blind bags as the current minifigure sets are done – meaning each package you purchase is a mystery who is inside. The nice part of this is the fun of the surprise and if you get extras you can always trade with friends to get the ones you need. There will also be classic movie characters like Alice and Cheshire Cat from Alice in Wonderland, Peter Pan and Hook from Peter Pan, and Maleficent from Sleeping Beauty. And of course from some of the newer films you’ll see Ariel and Ursula from The Little Mermaid, Aladdin and Genie from Aladdin, and Stitch from Lilo and Stitch. Our Pixar friends are included too! Buzz Lightyear and one of the Pizza Planet aliens from Toy Story are in the set as well as Mr. Incredible and Syndrome from The Incredibles! These will be made in the classic minifigure format instead of the newer Disney Princess and LEGO Junior lines featuring Disney characters. Instead of the more lithe and realistic features of the Princess and Junior figures, these will have that more solid, brick look although retaining the detail you are used to seeing from our friends at LEGO. LEGO has produced other Disney figures in the past including various iterations of Mickey and Minnie in the regular LEGO line as well as Duplo versions of the characters, but this is the first time they are releasing a collection like this for the minifigure fan! Sadly, not all of our favorites are being released in this first wave. With only 18 figures in the set, LEGO did a great job trying to intersperse the variety of characters being featured. Notably missing are Mickey’s pal Pluto and one of his best friends, Goofy as well as Mrs. Incredible, Woody, Jesse, Abu…and the list goes on. Of course that just makes it more interesting to see who will come out in the next set! Who are you hoping to grab? Who would you want to see in a future set? 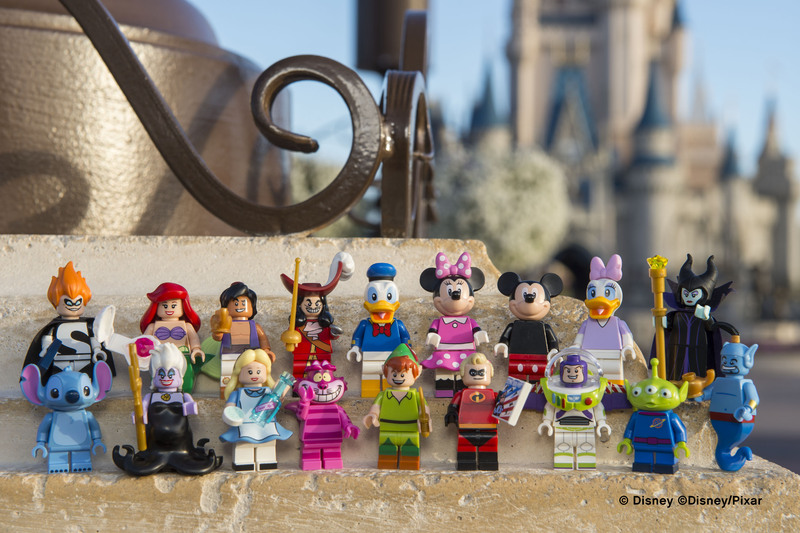 Disney LEGO minifigures will be available beginning May 1st!